For anyone seeking a good dose of fall color to carry you through winter's deprivations, the Plainsboro Preserve is just fifteen minutes away. I had heard they have a nice pond, but it's a full-fledged lake, born of a sand quarry operation now long past. As with the Fourth of July fireworks seen above Lake Carnegie, the lake's reflection amplifies the color of leaves and sky. and sweetgums. The trail sometimes fades, but just stick close to the lake. I'll write more about the place, but wanted to get the word out while the colors still hang on the trees. They have a nice Audubon visitor's center perched overlooking the lake, and lots of programming. There's a "full moon Friday" beaver walk on Oct. 30, and an open house on Nov. 7. More info on their website. Make yourself like rainwater, follow Princeton University's slopes down to the graceful Streicker Bridge that straddles Washington Road, and there you will find a trail through what I call the Hidden Valley. The trail begins under the bridge, branching off from a paved bikepath that goes around the back of the Chemistry Building. The valley's steep slopes and canopy of 200 year old trees give a sense of seclusion, despite being a stone's throw from Washington Road. Okay, "stone's throw" is an old expression, and probably should come with a cautionary warning in this safety-conscious era. By accidentally using it, I didn't mean to encourage or condone the actual throwing of stones, particularly with the off chance of hitting two birds, or a car driving by. It's a very stony valley, though, and when I was a boy, the impulse would definitely have been to toss a stone at the water in the stream, to get that satisfying kerplunk. The stream was restored to kerplunkable condition by the university. Bulldozers and backhoes lumbered up into the woods to carefully place boulders in the shape of "cross veins" which manipulate the scouring effect of the water to form a series of pools and riffles, which in turn make good aquatic habitat. There's evidence that nature's been throwing stones--big ones. The same powerful stormwater runoff from the campus that had degraded the original stream has also pushed some of the carefully placed rocks out of position. That got my land manager's mind going, which is to say I started noticing all the little interventions that could make a big difference for this small gem of open space. Call it a passion for maintenance, which either turns this post into a timely call for action (university grounds supervisor, please read!) or makes me something of a rude guest in this Hidden Valley, pointing out the flaws. A workday with some university students could get those stones back into place before surging stormwater pushes even more out of position. And the white oak on the left, 200 years old if it's like others in the valley whose rings have been counted, is having to compete with a smaller but quickly growing Norway maple that has invaded the valley. Norway maples are notorious for their aggressive root systems and a capacity to grow up in the shade, eventually outcompeting and displacing the native trees above them. The same slow drama is happening along the fencelines of people's backyards. Looking up, one sees the dense green leaves of Norway maple, not the oak's. Here, one of the old giants has succumbed, perhaps from the trauma of Hurricane Sandy, or the soil trauma of the stream restoration project, or from the root competition of Norway maples. Maybe all three. It would be relatively easy to cut down all the invasive maples, which otherwise will expand their impact on native shrubs and old growth trees. If we're going to be active, we might as well be pro-active. And porcelain berry, "kudzu of the north", has gotten a hold, here seen climbing over one of the witchhazels the university planted as part of the restoration. The extensive replantings of forbs, shrubs and trees, by the way, was very successful, despite the tough work of planting into shale, and it would be a shame if it all gets overrun by invasive vine. I'm sure the university tries to instill the values of early intervention and followup in its students. No better place to get a hands-on experience with that than in this Hidden Valley. Muscles remember far better than the mind does. This little foot bridge over the stream has an unfinished quality to it, unless it's designed to help athletes hone their sense of balance while walking between sports fields and boathouse to the west and the Jadwin Gym complex to the east. The main trail ends at Faculty Road, with the big field and Carnegie Lake just to the left in the photo. It's a fine little trail, sustained mostly by hikers and deer, with a mowed branch that heads over to Jadwin Gym, and another across the unfinished mini-bridge to Washington Road. The university's intention, according to those who designed the stream restoration, was to make this little valley welcoming to students and the general public. With its towering old trees, lovely stream and sense of seclusion amidst the university's bustle, the valley is rewarding to visit now, and could be even more so with some periodic informed intervention. We recently received a spirited invitation in an email. Some new friends, Tom and Inge, were heading to New Jersey's pine barrens for an overnight canoe trip, and invited a bunch of us to go along. I was quick to say yes, but wondered what all the excitement was about, in canoeing down a river in the Pine Barrens an hour down the road from Princeton. How much "down" could there be in that flat, sandy expanse, and what sort of river is it, anyway, if it doesn't get much more than fifteen feet wide? How rich in pleasure could a barren be? Nothing but the enthusiasm of the invitation gave any evidence of the charm, challenge, and beauty that awaited. Canoeing for me had always been the white water rivers of northern Wisconsin, where the rapids could swallow your boat and your gear if you made a wrong turn. Mostly we made brave family jaunts to the Flambeau River, the last journey being many years later, to let our father's ashes mingle with the bronze, tannin-rich waters, like grey flakes of sand catching flashes of sunlight as the current carried them away. That's how much love we had wrapped up in those rivers. Rapids or not, current or not much, we were now headed on an overnight canoe trip down a river I chose to call the "mighty Mullica", no matter how mighty it might turn out to be. Their generous offer had turned the tide enough to lure my urbaphilic family out of its routines, to venture beyond the limits of creature comforts and into the New Jersey hinterlands. The Mullica, draining the largest watershed in the pine barrens, was as advertised--narrow, slow-flowing--and yet its tight-cornered meanderings presented a surprising challenge even for a seasoned canoeist. Put your paddle down long enough to take a photo and the current might carry you gently but surely into a tangle of shrubbery. I had to draw on muscle memory to bring back the variety of paddle strokes needed to maneuver past lovely obstructions like this pine tree fallen across the water. There always seemed to be just enough room to slip by. The narrow channel offered a more intimate encounter with the surroundings than a big river, akin to a magical boardwalk that carried us along through an unspoiled landscape. Being the designated botanist for the journey, in the great tradition of early European explorations of America, albeit on a somewhat tamer scale, I immediately started grooving on the foliage. Hey. Sweet pepperbush, everybody! Also called summersweet because of its fragrance, which must really be sweet when canoeing this river earlier in the season, because it lines the banks for miles. Alas, no one was listening. The kids on the trip--enough to make a ten kid pyramid later in the trip--had all raced ahead in their sporty kayaks. We canoeists, laden with camping gear, held down the rear, allowing time to admire the beauty of the current's play on some sort of underwater grass. The grasslike clumps on the banks are actually tussock sedges, which year by year build their own individual pedestals to levitate above the muck. Every now and then, a patch of higher ground rising out of the marshy expanse would show off the underlying sand. Elsewhere, the vistas opened up with broad wet meadows, each having its own special mix of sedges and rushes. There were occasional backups where fallen trees or beaver dams stymied our multi-generational flotilla. Later on, round the campfire, the younger generation charmed us with spirited renditions of Michael Row the Boat Ashore, Goodnight Irene, Cumbaya and--just kidding! Somehow those tunes have not transferred to the next generation, which instead launched into a brainy, animated discussion that pivoted rapidly, in internet surfing fashion, from relativity to their favorite sci-fi flicks, to playing a game that required everyone to shut their eyes--a smart game to play when wet firewood is generating a lot of smoke. We could at least thank the rains the week before for making the mighty Mullica more mighty. If I had given a post-dinner lecture on the botanical world that surrounded us, I would have begun with a big tip of the hat to forest fire, which we reflexively think of as destructive, but not so. The charred bark on this shortleaf pine offers evidence of periodic "cool" fires that sweep through the forest, cleaning the ground of accumulated pine needles and fallen limbs and creating a beautiful, park-like landscape that welcomes light and exploration. Without periodic fire, the pine forest would become choked by debris. Seeds couldn't sprout through the thick mulch of pine needles. The trees and other plants are in fact cleverly adapted for fire. The pines and oaks grow thick, fire-resistant bark. The pine needles and thick, waxy oak leaves resist decay, and so continue to accumulate year after year until there's enough fuel to carry a fire through the forest. Pitch pines produce serotinous cones that only open after being heated by a fire, fortuitously spilling their seeds onto the bare mineral soil and nutrient-rich ash left behind. Fire's varied intensity kills some trees but not others, leaving an open canopy that allows enough light through for blueberries to flourish. Though the bushes get burned, they quickly resprout, to produce crops for a few years until the next fire comes along. Because fire is so important to this landscape, many are "prescribed"--intentionally lit by crews under optimal conditions of wind, fuel loads and humidity. That so few people know about fire's important ecological role speaks to how poorly we are served by the news media's reflexive portrayal of forest fire as a story about victims and perpetrators, a battle against nature. Those mis-portrayals lead to policies that suppress beneficial fires, thereby insuring that fuels in the forest will build up until the next fire will burn too hot, killing the trees and sterilizing the soil. Fortunately, the pine barrens is one place where enlightened management persists. After growing accustomed to the urban landscape, where anything dead must be swept away as quickly as possible, it's a relief both spiritually and aesthetically to enter a land where trees can have a long life after death, standing against the sky like sculptures in nature's garden, to weather slowly in the sun and rain. For a botanist, the word "barren" is associated with richness. Poor soil can actually foster high diversity, perhaps because the lack of nutrients reduces the aggressiveness of plants. Rich soil can empower one species to grow too vigorously over all the others. My campfire chat about the trees whose wood we burned might have included some tree identification. The pitch pines and shortleaf pines have needles grouped in threes. In contrast, the white pines planted around Princeton have groups of five, like the letters in "white". The post oak leaf on the right has a characteristic cross shape with rounded lobes. The blackjack oak leaf in the middle has a broad, rounded look, much bigger at one end, like a bison. The black oak on the left has small points at the tips of its lobes. Blackjack oaks don't grow much more than twenty feet tall in the poor soil, and when laden with acorns have the look of a fig tree. You can see how thick their bark is, even when young, the better to resist the flames that are sure to come. I might have talked about why the river was so zig-zaggy, how the forces of erosion work on the outside bank, causing the curves to become more and more pronounced. This photo is from the outside edge of one of those bends, which has become so sharp that one can catch both upstream and downstream in the same photo. I might have talked about the red maples, bright with fall color, that line both this river and Princeton's streets. They are adapted not so much to wetness but instead to the low oxygen conditions of soggy soils where water has displaced most of the air pockets. That adaptation works well for dry urban soils, where compaction also leaves little room for air. Overnight, we were treated to a coyote chorus, which started out sounding like a solitary owl, then quickened into a collective call. One of the Pinelands Adventures employees told me the coyotes are a coyote/grey wolf mix, with the grey wolf element having somehow made the journey from Michigan. One level of added pleasure on this trip was the silence, broken only periodically by a distant airplane. The background noise of the urban world is like static on a radio. What a relief to shed that clatter and enter a high-fidelity world where sounds are crisp and clear. Though the western horizon glowed with the light from Philadelphia and Camden, the night sky, too, was less cluttered with the urban static of light pollution. Stars were bright enough to give a hint of the Milky Way. Even the less than comfortable night spent on hard ground--mental note: bring better padding for underneath the sleeping bag next time, or try one of those hammock tents we saw at the next campsite over--led to an early morning walk to loosen up the back, and the chance to witness one of the most beautiful sights of all, the thick clouds of mist rising from the river as chill coaxed vapors skyward from the warm waters. Our campground stay concluded with a traditional pyramid photo session, with the pyramid orchestrated by Zoe Brooks, of Trenton Circus Squad fame. The Mullica was mightier the second day, with faster current and broader channel bordered by groves of Atlantic white cedar, whose tall, straight growth contrasted with the gnarled look of the pines and oaks at the campsite. Along more open stretches, switch grass lined the banks--switch grass being one of the grasses of the tall grass prairies where buffalo roamed. It surprised us all years back when it made a cameo appearance in a State of the Union address in George W. Bush's vision for a biogas future. and split-beard bluestem, a beautiful grass that looks like cotton when backlit. He collected specimens of this mystery grass to take back to the King of Princeton, as evidence of the richness and promise of these newly explored lands to the south. But mostly, he and everyone else brought back memories, of young voices around a campfire, the green of craggy pines against a deep blue sky, the crispness of sounds against a backdrop of silence, the relaxed flow of water, and a reflection or two. After many years of planning and design, two new footbridges have been completed at Mountain Lakes Preserve. A ribbon cutting is scheduled for 1:30 this Sunday, October 18th, followed by a reception at Mountain Lakes House, hosted by the Friends of Princeton Open Space. The project dates back to when I was working for FOPOS, and if memory serves, I helped direct a funder to the board, which then chose the bridge project. Thus began a long process of seeking the necessary permits to build in a floodplain. Before the bridges could span a stream, they had to negotiate myriad natural and regulatory hurdles. For my part, I remember cautioning the planners not to locate the bridge where two hazelnut bushes grow, since there are so few examples of that species in Princeton. Town engineers put a great deal of effort into designing the bridges to minimize the risk posed by shifting streambanks and powerful floods. The bridges will not only open up a corner of the preserve previously hard to access, but should serve as nice spots to pause and look down into the water. 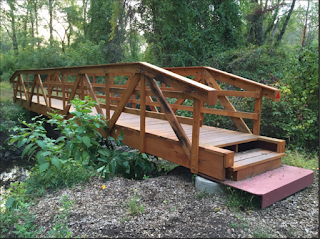 The dedication of the bridges, with a reception at a house whose preservation has greatly benefitted open space, is a clear demonstration of how buildings and other infrastructure, historic or not, can complement the open space that surrounds them. In addition to providing office space for several nonprofits, Mountain Lakes House hosts weddings and other events, income from which is then used for acquisition and management of open space in Princeton. Despite this excellent example, property being considered for open space preservation is still considered tainted if it has a house or other built structure on it--a contradiction to ponder while standing on a new bridge, peering down at the mysteries of Mountain Brook. Those planning to attend are encouraged to rsvp at info@fopos.org. Nature makes its way into Emily Mann's adaptation and direction of Tennessee Williams' Baby Doll at McCarter Theater (the synopsis, here, comes with a spoiler alert). There are the two cameos of a live chicken wandering into the kitchen of the dilapidated southern manor that serves as metaphoric backdrop for this drama. There's the seedhead of a dandelion that Silva picks up and blows, in an early expression of his poetic side, its seeds scattering like all the people who come and go in the world. The endearing, somewhat batty housekeeper calls roses "poems of nature" as she cuts one and clutches it as if trying to hold onto a life that is slipping away. And there's the refreshing well water that only Silva, a brown-skinned Sicilian Catholic looked down upon by a decadent white protestant society, can summon from the cool depths of earth, a salve for the oppressive Mississippi heat. Inner and outer nature correspond in the two male characters. Silva's power comes as much from his inner nature as his physical stature, not from a rigged system of social status that props up the likes of Archie Lee--as rotting and haunted a hulk as the house he bought for cheap. Only in the character of Baby Doll are inner and outer natures at odds, a physically mature woman emotionally starved and stunted by circumstance. The most riveting tension is between two aspects of Silva's personality, which travels from volcanic anger to poignant affection. He merges menace and charm, his anger mixing and dissolving into a gentle caress. He carries a whip, or more accurately a crop, which is a short whip to be used while riding a horse. There's a soft leather tip that allows the rider to influence the horse without leaving a mark. It makes an effective prop that serves not as a weapon but like a baton to channel the orchestration of his anger and influence upon the other characters. Not far beyond the stage, the cotton crops are stripping the soil of its original fertility, while Archie Lee seeks to strip the female characters of their last shreds of self respect. Cotton drifts invisibly across the stage as dust from the mill, irritating Baby Doll's sinuses. Exploitation of nature mixes with the oppression and infantilization of women, but the play offers hints of a better world where a woman's nature finds appreciation and respect. As a botanist who magically got a last minute seat in the front row, I can say that though the plumes of Maiden Grass (Miscanthus sinensis) look great in one corner of the stage set, the bluestem grasses mixed in are a lot more authentic. May I recommend Andropogon glomeratus as a visually similar native substitute for the Japanese Miscanthus for the next production? This is the sort of in-depth botanical theater analysis you can't find anywhere else. "I haven’t read too many plays in my time, but I could read every play ever written and never find a better ending than you got here in Baby Doll," (in which the characters remaining on the stage--don't want to give it away) "speak not only for themselves, and maybe for the play as well, but also for every writer, every actor, every human being who’s ever lived." That would be some sheriff, to talk like that. I didn't get the part, but at least said my piece. Continues through October 11, followed by the hugely funny "A Comedy of Tenors". The second sighting of Mile-a-Minute, a.k.a. Persicaria perfoliata--Princeton's new invasive species with triangular leaves, sharp spines, and speedy growth--came two weeks ago during a tour for a visiting friend of my various habitat restoration projects around town. and wild rice thrives. Runoff and seepage from the slopes of Institute Woods are augmented by water pumped from the Stony Brook to keep the marsh wet through summer droughts. For anyone seeking auspicious partnerships between people and nature, between private, public and nonprofit, will find it here. The land is owned by the American Water Company, which pays for the electricity to run the pump, which in turn is maintained by the municipality. The Friends of Rogers Refuge, not quite a nonprofit but an official volunteer organization nonetheless, is the entity that cares most deeply about the marsh and the birds it provides habitat for, and so pays the attention necessary to make sure the pump and everything else is running smoothly. But I was talking not about functioning habitats and symbiotic institutional relationships, but about the new invasive threat on the block, which we encountered on the drive back out of the refuge. There, climbing up a big blob of porcelainberry surrounding a telephone pole, was the Mile-a-Minute. It was a smaller patch than I had found at the Princeton Battlefield several weeks prior, but that two patches have now been found suggests that this invasive has gotten a foothold somewhere in the Princeton area, and birds are spreading the seeds across town. This patch, too, found its way into a plastic bag that was sealed and will be put out for trash collection, lest its seeds spread. The gravel driveway into Rogers Refuge, by the way, is exhibit A of how invasives can take over a landscape and render it inedible to wildlife. The original alteration of hydrology to build the road discouraged natives and made perfect habitat for invasive species. Japanese stiltgrass lines the edges. Here, the "grass on stilts" reaches up towards another invasive that's much better at climbing, porcelainberry. That moundy appearance is porcelainberry vine growing over everything. As stiltgrass coats the ground of our forests and displaces the turfgrass in our lawns, porcelainberry expands its elevated, kudzu-like dominance across Princeton. Asian photinia, note the unusually obovate leaves (wider towards the tip) whose capacity to take over the forest understory was first demonstrated at Mountain Lakes preserve, is also having a good year. Even if this invasive multiflora rose is succumbing to rose rosette disease, another invasive, Japanese honeysuckle, comes along to climb over it. This sign, from back in the '70s when invasives must have seemed a minor annoyance, says not to take or injure any plants. But some of those rules that seemed to make sense in the 1970s make no sense now. I made sure to return to take one plant, that prickly Mile-a-Minute. You, too, can be a plant keeper. Keep an eye out for Mile-a-Minute, and contact me if you see it.